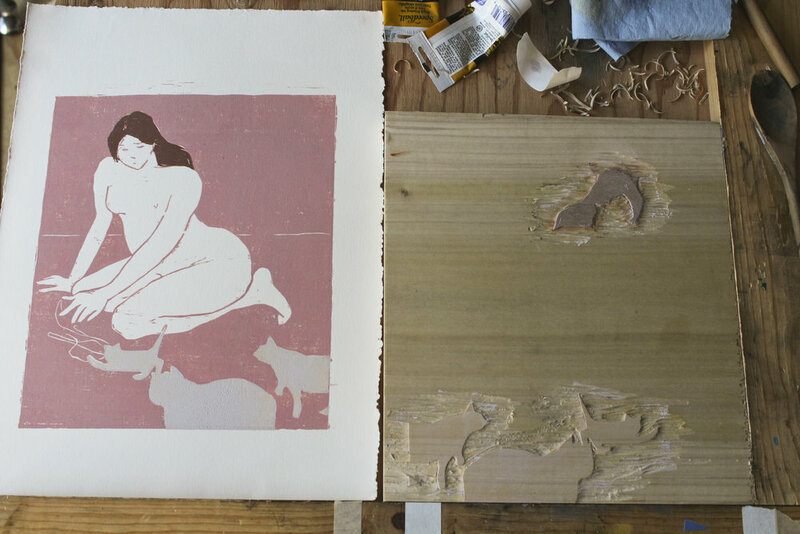 The printmaking process allows for the production of multiple originals. A woodcut or woodblock print is an image printed from the carved surface of a block of wood. The following prints all began as a sketch- I used the drawing to determine which block would hold the most information, and which blocks would provide additional colors. From there, the blocks were carved and inked, testing many ink and paper combinations along the way. Much like a puzzle, the complementary blocks fit together to create the final image. This series of prints draws inspiration from my painting studies to explore endless color combinations. This print consists of five colors distributed over three blocks. Divers Cover, Day, Night, & Sunset were created for Laguna Art Museum's centennial events in 2018. I was interested in how color can indicate a certain time in a landscape. I printed small editions of 12 for Day & Night. The first block printed. I created an edition of 12 prints in this single color. The second block printed. Cat Lady was inspired by a figure in a Felix Vallotton painting. Using these two blocks, I printed a small series of one-of-a-kind prints. These prints are available for purchase here.